Did You Know? Neytiri Visits The Scribe’s Desk! Neytiri Visits The Scribe’s Desk! Sort of. 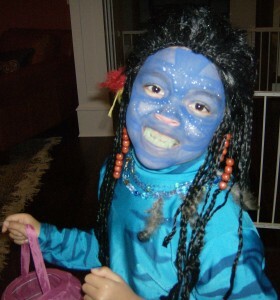 It’s my Youngling dressed up for Halloween as the blue warrior woman herself when she was 6. I always wondered what Neytiri looked like when she was a kid. Didn’t you? Hope everyone enjoyed a a fun and safe Halloween! Avatar, Fantasy, Halloween, Neytiri, Youngling. Bookmark.